These days, even the smallest data loss—fewer than 100 files—can cost businesses between $18,000 to $35,000, according to Datto. Protecting data has become essential for even the smallest businesses. But since not all data backups for SMBs are the same, it’s important to compare your options carefully. Where and how should your backups be stored? How do you know your backups can be recovered? Are your backups safe from threats like ransomware? In this post, we address why these questions are so important and how to select the right backup and disaster recovery (BDR) solution for your organization. In March 2018, the City of Atlanta was hit by a vicious SamSam ransomware attack. The attack shut down city services, disrupted its court system and even destroyed police evidence. All but six of the city’s 77 computers, as well as 10 years’ worth of documents, were lost. Attackers demanded $51,000 in ransom to restore the data. But that was chump change compared to true cost of the disruption. By April, the city had spent $2.4 million on recovery efforts. And by June, city officials predicted the recovery would cost an additional $9.5 million over the next year. That’s roughly $12 million in damage from a single ransomware attack. The Atlanta incident is just one of several high-profile attacks that have shed light on the dangers of ransomware for SMBs. But ransomware is only one of several serious threats to your data. Regardless of the cause, data loss can be devastating, especially for smaller companies. The recovery costs alone can skyrocket, especially if the data loss is disrupting operations. A single hour of inactivity costs smalls businesses nearly $9,000 on average, according to the Aberdeen Group. That’s $9,000 per hour. Needless to say, this is why data backups for SMBs are so important. Data backups for SMBs come in many forms. But while some are useful for basic file storage, not all are designed to be full-fledged disaster recovery solutions. Disk, tape and Flash backups (on-site): Traditionally, business data is backed up to disk drives, Flash storage or even magnetic tape, external to the machines/devices that are writing the data. One example of this would be a server that replicates data to separate disk drives. This could also be referred to as direct-attached storage (DAS). Off-site public/private cloud backup: Cloud-based backups are essentially the same as the traditional backup methods above, except the data is stored in an off-site datacenter, either managed by you (i.e. via a private cloud) or a third-party provider (public cloud). Hybrid: Hybrid backups are stored both on-site (for the greatest recovery speed) and in the cloud (for added protection against on-site data loss). More on this below. Network attached storage (NAS): NAS is a storage device attached to a network device (i.e. a network server or router), allowing for file storage and sharing across the network. Desktop external drives: Smaller businesses without IT departments will sometimes use external hard drives or even USB flash drives for lightweight file backup, though there are better ways, as we address further down. Cloud-based file sync & share: These online services provide a relatively basic backup of device files and folders, storing them in the cloud. Examples of this would be Google Drive, Dropbox or Datto Drive. Those options mostly answer the question of where your data is stored, but not necessarily how. When you’re talking about backing up large amounts of data, you need to consider how it can be transferred to storage in the quickest and most efficient fashion. Full: A full backup of all files, which takes up the most storage space and takes longest to complete. Incremental: Only new or modified files are backed up and added to the full backup in increments, thus eliminating the need for additional full backups. Differential: Similar to incremental backups, differential backups include all new or modified data since the last full backup—but not in increments with each new backup, thus requiring a lot more storage. Mirrored: Mirrored backups are basically exact clones of files, rather than compressed or image-based backup files, thus requiring the greatest amount of storage space, but also offering the quickest recovery in certain scenarios. Inverse Chain: Unique to Datto’s SMB backup technologies, an Inverse Chain process starts with a full backup followed by incremental backups. But unlike traditional incremental backups, every previous recovery point is stored in an independent, fully constructed state. We’ll come back to this in a minute. Between all these options, you’ll find numerous providers of backup software and BDR systems, each offering their unique data-protection solution. Help! Which is right for me? In short, it depends. But while your options may seem overwhelming, you can narrow your choices by considering your business’s specific data needs and usage. Which data is critical to your business? What is the potential impact of losing that data? How quickly do you need to be able to access a backup? How old can the data be in your backup without causing a major disruption? The answers to these questions will help to identify several of your requirements, such as backup frequency, recovery time objective (RTO) and storage space, to name a few. Right off the bat, we can tell you that USB Flash drives and FSS are not going to be enough for most small to medium-sized businesses today. Sure, those options do serve their unique purposes for file storage and sharing. But to prevent a major data loss, most SMBs will need greater protection. So, what should be included on your BDR wish list? 1) Inverse Chain Technology: Datto’s inverse chain technology eliminates the most common problems in traditional backup chains. By using ZFS’s copy-on-write capability, backups are not dependent on previous snapshots. Each unique block of data is saved only once and is referenced by all of the restore points that use it. There is no rebuild process when reverting to a previous point in time. Inverse Chain Technology is unique to Datto’s BDR solutions and services. 2) Hybrid Cloud Technology: As we mentioned above, hybrid cloud provides the best of both worlds: an on-site BDR solution for fastest possible access to backup data, combined with the added redundancy of mirrored backups in the cloud. And, in the case of Datto’s solutions, backups can be virtualized in the cloud, just as they can on-site. 3) Virtualized Backups: Virtualization has become a must for companies that require uninterrupted access to their data and applications. When your backups are fully bootable virtual machines, you can virtualize them instantly, from anywhere. That means that companies can continue to access their data and run their business-critical applications in a virtual environment immediately after a major data loss, like a ransomware attack. To be clear: all of our recommended technologies above are available in Datto’s BDR and DRaaS solutions. Beyond merely backing up your files, Datto’s technologies enable true business continuity—they’re literally built to minimize downtime in every way possible. Also, on top of all the benefits we’ve covered above, we like Datto because it gives SMBs enterprise-grade protection without the enterprise-grade price tag. A good entry point for small businesses is Datto’s ALTO 3, or the all-Flash SIRIS X series. Both are designed specifically for small businesses and they offer all the crucial technologies we’ve recommended above: hybrid cloud, virtualization and Inverse Chain. The SIRIS X series offers the added speed of SSD and is ideal for businesses with single license backup needs. Never select a backup solution all willy-nilly! You need to carefully determine your needs or consult an expert. Start with a business continuity plan (BCP). This will help you identify your organization’s unique risks of a disaster (data loss and otherwise), the potential business impact of those events, and your technology requirements for maintaining continuity. 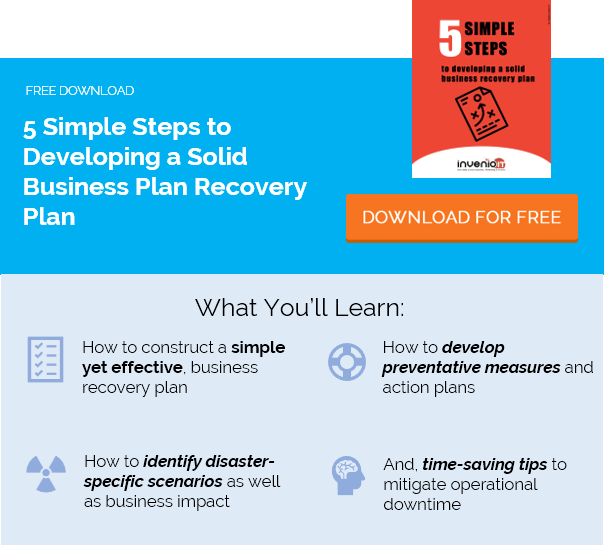 Your BCP is an essential first step to ensuring that you’ll select the right data backup for your SMB—and that your recovery teams will know exactly how to leverage that technology when disaster strikes. Learn more about Datto’s data backup solutions for SMB by requesting a free demo from Invenio IT. Our business continuity experts are happy to go over your options. If you have questions, give us a call at (646) 395-1170 or email [email protected].